Quinn Wolcott's ejection of two Tigers has led to speculation that Detroit threw at the umpire in retaliation. Did they? Or was Wednesday's occurrence a sequence of unfortunate coincidence? New comments from Detroit Manager Brad Ausmus and catcher John Hicks on Thursday prove factually inaccurate, incomplete, or otherwise call into question Wednesday's events, with Hicks' comments in particular appearing to be contradicted by video evidence. Related Post: MLB Ejections 172-173 - Quinn Wolcott (McCann, Ausmus) (9/13/17). Wolcott reacts to being hit by a fastball. The Play: With two out in the bottom of the 3rd inning of Wednesday's Tigers-Indians game, Wolcott ejected Tigers Manager Brad Ausmus and catcher James McCann for arguing balls and strikes (QOCY). A batter later—after four more correctly officiated ball calls thrown to replacement catcher John Hicks behind the plate—Tigers pitcher Buck Farmer's first pitch to Yandy Diaz struck Wolcott on the upper collarbone/shoulder area. Was it intentional or an accident? Background & History: Unfortunately, years of vitriolic attitudes towards umpires, such as "kill the umpire" and the like, have led to certain circumstances where players—sometimes with coach/manager involvement—have thrown at umpires in retaliation for what they have perceived as missed calls. This primarily has appeared at the sport's lower levels, such as recreational softball, travel baseball, and high school baseball. Knox appears to premeditate an ump attack. 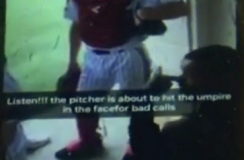 In June, we shared video of EvoShield Canes Texas coach Jeremy Knox allegedly instructing his players—including a pitcher and catcher—to "hit the * umpire in the * mask." Related Post: Coach Filmed Allegedly Plotting Umpire Assault (6/2/17). Farmer in High School: Buck Farmer was born in 1991; he was 17 years old—a high schooler himself—when news spread of Stephen County High School pitcher Cody Martin throwing at an umpire as catcher Matt Hill ducked out of the way during a Georgia high school playoff game. Farmer attended Rockdale County High School, which is located in Conyers, Georgia and less than 100 miles from Stephen County HS. Chances are pretty decent that Farmer had knowledge of the incident. Analysis: This all takes us to Wednesday's game. We often hear about rules changes, attitude problems, and the like trickling down from the big leagues to the little leagues, but could the opposite be true as well? Diagram of Timestamp :12: O'Nora sprints in. Consider the game situation: Bottom 3rd, two outs, bases loaded, 0-0 count, 4-1 Cleveland lead. This would be a particularly poor time to throw a potentially wild pitch. That said, batteries throughout baseball know that an umpire sets up in the slot (or whatever name a player chooses to give it). What is particularly useful to consider is a player's immediate reaction after the moment of impact (zero-to-two seconds after), as well as the player's delayed reaction (two-to-five seconds afterward). The most immediate reaction is known as a microexpression, applies to facial properties, and extends to body language in physical domains (such as sports). Microexpressions generally occur in high-stakes situations where the subject has an immediate emotional reaction to an event. Farmer: Farmer's immediate reaction off the mound indicates he intended to throw the pitch to the location where the ball ended up—not that he necessarily intended to hit Wolcott—but that the pitch was not a mistake: the selection (fastball) was correct and the location (up and inside-edge) was correct. Farmer slightly raises his arms and shrugs shoulders as if imploring of Hicks, "what happened?" Farmer's reaction is consistent with a pitcher who believes his catcher was "crossed up." Hicks: Hicks' immediate reaction is to field the live ball. After retrieving it, as the ball becomes dead, Hicks walks toward Farmer, takes one glance back at Wolcott without breaking stride toward his pitcher, and continues walking. This similarly supports a "crossed up" theory, but also suggests the catcher is not exactly dissatisfied with the outcome of an injured umpire. Diaz/Edwin Encarnacion: Notice that both Diaz and Indians baserunner R3 Edwin Encarnacion have strong reactions to the hit-by-pitch. Encarnacion at third base even places both hands atop his head in response as Diaz cautiously walks back to check on Wolcott. O'Nora/Emmel: O'Nora immediately enters into a sprint toward Wolcott, while Emmel first begins walking, before quickening to a jog in towards home plate. O'Nora appears to have greater concern. Post-Game Comments: In his postgame comments, Farmer tweeted his defense, stating at one point, "I'm not Hicks so I don't know that answer" (to an observation noting that Hicks did not check on Wolcott) before adding, "Not intentional on Hicks part either (sic)." Hicks did not issue any post-game statement, while ejected Manager Brad Ausmus took umbrage with the suggestion that the conduct was intentional. Thursday Comments: A day after the incident, Ausmus defended Hicks' actions, saying, "The ball's live! He's got to get to the ball. It's not dead because it hit the umpire." Hicks parroted Ausmus: "[I didn't check on Wolcott] because I couldn’t. Instantly, I went to get the ball. The bases were loaded. I’m first trying to keep guys from scoring." And after Hicks got to the ball and it became dead, when Hicks started walking in fair territory? Hicks looks at an injured and isolated umpire. 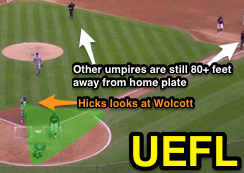 Hicks said he did not check on Wolcott, "because the other umpires were all around him, and I wasn’t going to jump in there with those guys." Hicks then implored skeptics. As The Detroit News put it, "Hicks said any analysis of game video would make clear there was no mischief." OK...let's analyze the game video. 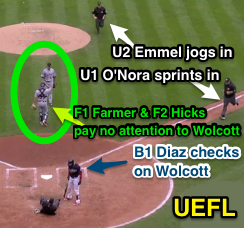 At the six-second mark—as Hicks looks at Wolcott while walking to meet his pitcher—there are no umpires around Wolcott. In fact, umpires Emmel and O'Nora are still over 80 feet from home plate. O'Nora does not arrive at the plate until the 12-second mark. That is a full seven seconds after the ball became dead. Brad Ausmus shows his respect for umpires. Conclusion: At best, Hicks appears to have suffered from a distinct lack of compassion; his actions both in the immediate aftermath and upon seeing the injurious result of the pitch are consistent with a person amenable to the outcome of another person on the ground in pain. A slightly more sinister interpretation places the catcher's reaction in the realm of schadenfreude. At worst, Hicks failed to catch the ball on purpose. Similar remarks can be made about Ausmus, though Farmer at least wanted to assure fans that he spoke with Wolcott and made sure he was okay. Replays indicate Hicks eventually did ask if Wolcott was okay as well. In a classic case of umpire scapegoating, Ausmus turned the conversation into Detroit's dissatisfaction over Wolcott's strike zone, rather than Wolcott's wellbeing. The strike zone numbers, naturally, do not support Detroit's allegations of discrepancy, as Detroit was actually +1 for this game. 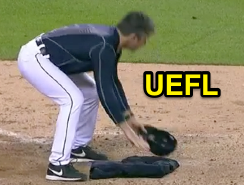 We know how MLB treated the Ian Kinsler-Angel Hernandez fiasco. 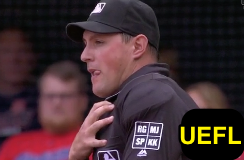 Will anything be addressed here, is Ausmus' laissez faire reaction to the incident the new normal, or will the World Umpires Association have to think of a new, CBA-approved way, of protest? Related Post: MLB Ejections 134-35 - Angel Hernandez (1-2; DET x2) (8/14/17).